When I was a little girl my ambition was to read all the books in the library, to run a doll hospital and to make dioramas for museums. Now I work in the medical field, have a huge personal library, and make artwork in the form of hand-made books, utilitarian quilts for relatives and orphaned boys, and portraits of people and places. It’s a long road from that little girl dressed in tie-back dresses and pigtails who cherished trips to the library. My artwork has developed in several directions; abstractions, portraiture, and flights of fancy in terms of hand-made books complete with illustrations and fantasy stories. My only problem is that my mind thinks faster than my fingers can work and there is so much to choose from. 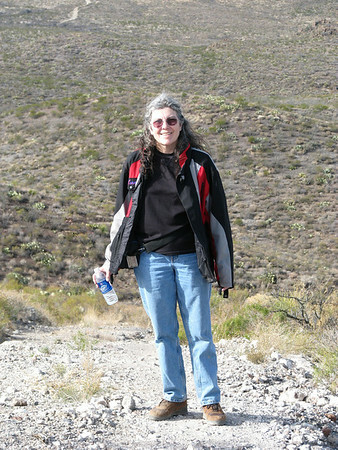 Here I am climbing a hill in Big Bend National Park in Texas. It is hard to see the steepness of that road but I chose to walk up it rather than ride a motorcycle. P.S. I am also a fiber artist who suffers from having a mind that is continually working on new ideas of things to do and I physically can’t keep up! I too love books and enjoy audio books while working on my quilting projects. I don’t blame you, I would walk ten miles before I got on a motorcycle. I’m sure working in the medical field you have seen your share of terrible bike accident results. Not so many motorcycle accidents as car accidents in which people were driving beyond their ability to see AND in bad weather for not very good reasons. In rain deluges, ice, and snow, motorcyclists tend to stay holed up, people in cars think they are impervious and think they should drive 10 miles above the speed limit just because they can.Fortunately for me, most places I worked were not high level trauma and so they were shipped elsewhere but occasionally the weather was so bad, they came to me–it was not fun. So now I have hung up my ER stethoscope and concentrate on a walk in clinic where the worst thing I see is poison ivy. I was a nurse…with my dolls, my friends, locally wounded animals, actual patients, the dying…and eventually my late DH. Now I live in a hamlet on the rolling Western Canadian prairie…and thank you for sharing your dreams…alike, but different. Blessings! isn’t it interesting how so many of us who outwardly would seem different but yet are so alike? I just caught up with your blog… bees….giant sculptures… no place to leave comments there? I was going to change my name when I was in second grade and my mother said Ok. Then my teacher called me in to talk to me. She said if you change your name you won’t be able to take any books out for TWO weeks from the library. That was the end of charging my name as I couldn’t give up the library books!